For those who haven’t heard, I’m currently on a 10 day silent meditation retreat in California. Yes, completely silent. No computers, no cell phones, no talking, not even any books. 10 Days! Crazy, I know. The reason I’m subjecting myself to this strange form of amputation is so that I can experience what it’s like to have the internal chatter in my mind stop completely, and just be present in the current moment. Few things have benefit my life as much as meditation and mindful practice. Mindfulness helps me focus and work more efficiently. It helps me be more aware of my emotions so I can be more honest and compassionate with others. It helps me feel gratitude for both the simpleness and complexities of life. It even helps me sleep. Mindfulness has also had a tremendous impact on my eating habits. I used to eat incredibly fast (“efficiently” was what I told myself), and I didn’t think there was anything wrong with it. Then I started noticing all the scientific research about the importance of eating slowly and mindfully and decided to give it a try. 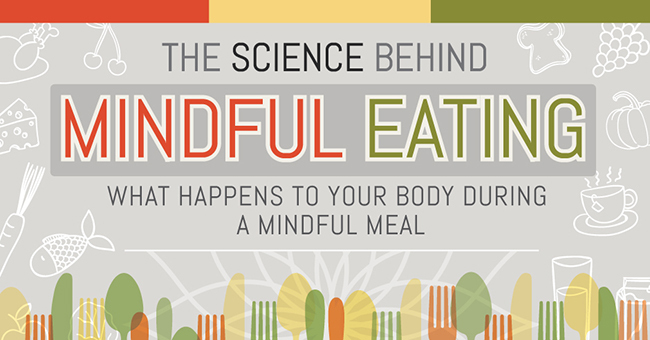 Mindful eating was a difficult habit to develop, but the benefits have been remarkable. The stomach aches that plagued me most of my life virtually disappeared. I learned the pleasures of eating slowly and completely chewing my food. I’m able to linger longer at the table and savor the food and company. It’s far easier to eat reasonable portion sizes. To celebrate mindfulness this week I partnered with my friends over at NordicTrack to create this infographic describing why and how to practice mindful eating. I hope you enjoy it, and feel free to share. Joint infographic created in partnership with Summer Tomato and NordicTrack. To hear more about my experience on my silent retreat be sure to subscribe to the Summer Tomato newsletter. Have you tried to practice mindful eating? What has been your experience?